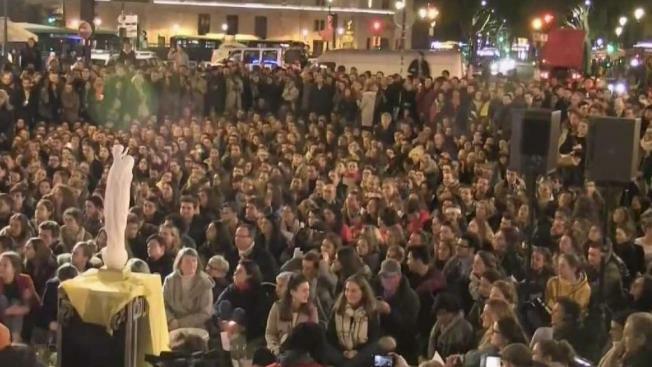 Parisians sang, lit candles and prayed to pay tribute to Notre Dame Cathedral after Monday's fire. Pei-Sze Cheng reports from Paris. Fueled by a lattice of centuries-old timbers, the fire moved hungrily across Notre Dame's rooftop toward the cathedral's iconic spire. It belched yellow smoke, spitting out gritty particles of wood, stone, lead and iron and wanted more. Far below, their vision obscured by fumes and tears, firefighters, priests and municipal workers passed treasures hand-to-hand, hoping the speed of desperation could outrun the flames. The first alarm sounded at 6:20 p.m., silencing the priest and a few hundred worshippers and tourists inside. "Everyone was immobilized by shock for maybe a minute," said Johann Vexo, who was in the organ loft for Monday Mass. Shock, but no panic. The rear doors opened and within a few minutes, the cathedral was empty, he told Ouest-France newspaper. For 23 minutes, it seemed like a false alarm. Then at 6:43 p.m. a second smoke detector went off and the fire showed its face, flickering in the wooden timbers and visible to anyone looking north from Paris' Left Bank. The first firetrucks lumbered through rush-hour traffic, blasting their two-tone sirens at full volume to reach the island that is the historic and geographic heart of Paris. For that first half-hour, it looked like the fire couldn't possibly leave more than a small age mark on the nearly 900-year-old building — more akin to the inevitable wear on stone's rough edges than the fury of the French Revolution that left it in ruins for decades. Across the Seine in City Hall, Mayor Anne Hidalgo glanced out the window during an evening meeting to see a yellow cloud blotting out the sky. She rushed to the island. "I came here and felt powerless as the flames overtook the cathedral," she said Tuesday. Bridge after bridge along the Seine filled with somber onlookers, all facing the cathedral built for the ages. They dotted the stone walkways that line the river. They wept as flames overtook the rooftop spire. Below it, nestled deep in the cathedral, was the treasure chest, keeper of Notre Dame's most sacred relics. 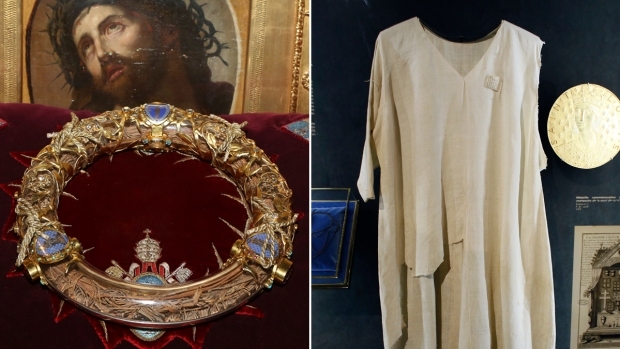 Firefighters cracked the chest open, pulling out the Crown of Thorns revered as the one worn by Jesus Christ at his crucifixion. Made of rushes wrapped into a wreath and tied with gold filament, it had been kept under glass since 1896. 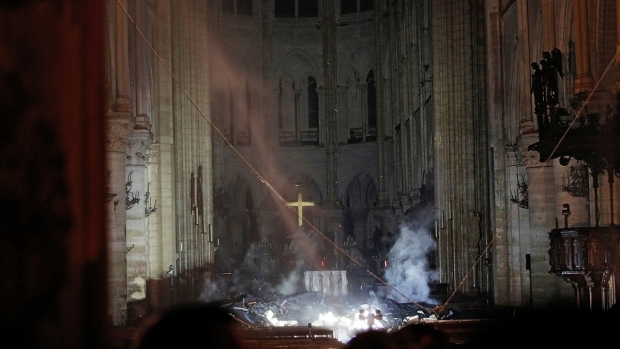 The tunic of St. Louis, believed to have belonged to King Louis IX, came out of the chest along with fragments of the cross and a nail, said Patrick Chauvet, rector of Notre Dame Cathedral. "We had to get them, in the smoke, as debris was falling to protect them," Gen. Jean-Claude Gallet of the fire brigade told BFM television. At 7:49 p.m., the 19th-century spire that was the architectural masterpiece of Eugène Emmanuel Viollet-le-Duc and his post-Revolutionary restoration broke apart and fell through the nave. The bronze weathercock tumbled, taking with it three relics sealed inside in 1935. It had been 66 minutes since the first flames were spotted. The sky above the cathedral flamed orange, and the fire lurched toward Notre Dame's iconic towers, then slipped inside. As darkness fell, 20 firefighters climbed inside the two towers "at great risk to their lives, to attack the fire from the inside and save the building," said Laurent Nunez, deputy interior minister. The spire was lost. Could Notre Dame itself be saved? From inside and out, firefighters fought the battle of their lives — a battle for the ages. At 9:49 p.m. Nunez voiced the fear that haunted Paris and beyond. The smell of smoke had long since reached beyond the city center, permeating homes and apartments miles (kilometers) away. Sirens wailed ceaselessly. Hundreds of firefighters were doing their utmost. And, Nunez said, no one knew whether it would be enough. The 20 firefighters struggled on in the towers. Red-hot embers floated down from the glowing hole where the spire once stood, settling on the blackened marble floor and the pile of debris that was all that was left of the spire. It had been "a masterwork of Viollet-le-Duc" and a tribute to what restoration could achieve, said Kevin Murphy, an expert on historical restoration from Vanderbilt University. It was gone, as were the roof's irreplaceable ancient wooden beams, cut from trees that were alive a millennium ago. At 11:23 p.m., the fire chief said the rest of the structure, including the cathedral's twin bell towers, had been saved. It had been within 30 minutes of collapse. A massive fire engulfed Notre Dame Cathedral in Paris on Monday, toppling its spire and sending thick plumes of smoke high into the sky. It took 10 more hours for the last flames to be put out. The spire's bronze rooster, long a symbol of France, was found Tuesday, deformed by the heat but recognizable nonetheless. "Beyond emotion, beyond words, beyond tears," Christophe Castaner, France's interior minister, said Tuesday as he visited the cathedral, "What I want to express is the pride of the men and women who committed to saving Notre Dame."